The Bulleid / Raworth Co-Co Electric 'Booster' Locomotives. Another Southern Railway 'locomotive' design associated with Bulleid was not steam; but an electric locomotive which again featured his modern (for the 1940s) streamlined boxy look. With the electrified system expanding, (used primarily for passenger multiple units), two pioneering Co-Co electric locomotives were designed for mixed use. These were built jointly by Chief Mechanical Engineer Oliver Bulleid - who designed the exterior shell and mechanical parts; and Chief Electrical Engineer Alfred Raworth - who dealt with the electrical systems. In designing this 3rd rail electric locomotive, they were aware that the distance between the front and rear pickups for the electric supply is much shorter than on multiple unit sets. Thus the electric traction supply could be lost when a gap between conductor rails was greater than the distance between the pickups. To overcome this, 3rd rail power was used to drive M-G sets [a 600/750V motor + heavy central flywheel + 600/750V generator]. Then if the track supply was briefly lost whilst 'gapping', traction power was maintained by the flywheel inertia generating on its own. The Raworth locos had two traction Motor-Generator sets, each driving the motor bogie beneath it, powering three independant 245hp traction motors strung across each set; hence a Co-Co designation. An additional auxiliary generator set giving 152 VDC control voltage was used for charging the booster M-G field generator supply batteries, to give a stable DC source for regulated output when the loco gapped. The locos were designed to use EP switch gear (NA5 type) from the contemporary '36 stock suburban' (4-SUB) and 'interurban' (4-COR) multiple units of the day. They also used two DH25 compressors for air supplies to the locomotive, the same as the multiple unit stock. One of the original M-G sets survives at Strawberry Hill depot in SW London. These generator sets gave rise to a nickname of "boosters", perhaps accounting for why Mike Morant remembers them aurally, as being "fiendishly noisy", also noting that in his world - "they've always been known as 'Hornbys' probably in view of that aforementioned racket, although it might also be due to the fact that they looked for all the world like a crude little train set", (said with much affection for the class). A centrally located pantograph, partially hidden in a roof well, was intended for overhead pickup in sidings and depots without third rails, although the overhead wiring had often to be specially erected to allow these shunting duties. The first two locomotives were built to Ashford diagram SR 37, being 56ft 9in long, weighing in at 99 tons, with a tractive effort of 40000lb. They had a cab with duplicated controls at each end, and the central electrical compartment had a partitioned off electrically heated boiler for carriage heating. Top service speed: 75 mph. The main frames and solebars were welded from channel sections, the body made of metal sheets fitted over a frame, now a Bulleid standard. The plate frame bogies were riveted and welded, supported on four quadrants rather than a central pivot, (repeated on 10201); and featured BFB wheels of 3ft 6in diameter. CC1 was completed at Ashford works in 1941 (renumbered 20001 by BR). At first it ran in photographic grey livery, and then repainted into malachite green livery with Southern "Sunshine" lettering and yellow lines at solebar and cantrail level. CC2 (later 20002) was completed in 1945, finished in malachite green livery. There was apparently a lot of timber work in the body of CC1 & 2, particularly at the ends. Clive Young's father was Sawmill Foreman at Ashford, and was responsible for the manufacture of these items. Third in series No. 20003. Drawings by British Railways Southern Region. In 1948 B.R. constructed a third electric, to Ashford drawing A9043; this had a modified appearance similar to the latest EMUs, more slab fronted with deeper windows. 20003 was also 1ft 6in longer, heavier at 105 tons, capable of 45,000 lb tractive effort, and had a larger boiler water tank slung on the central underframe. It included more modern electrical equipment and refinements learned from the earlier two locos. 20003 was also out-shopped in malachite livery with yellow lining, but with yellow British Railways lettering and numbering. 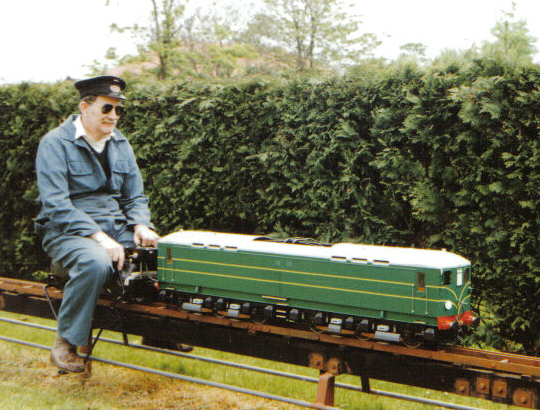 The photo shows a lovely model of CC1 in 5" gauge made by Michael Ennis, completed around 1997, and powered by four car wiper motors. Finished in Southern malachite green, with yellow speed whiskers, it received a highly commended certificate at the M.E. Exhibition. From 1949/50 the locos were treated to the new black and aluminium colour scheme chosen by British Railways for diesel, electric and gas turbine locomotives. Then from the late 1950s they carried green livery with a red and white line half way up the side stopping short of the cab doors, and a pale green frame; and were fitted with twin roof mounted air horns. Before it was withdrawn 20001 was presented in BR blue with full yellow ends. They seem to have had productive lives, happily hauling freight, but also regulars on the Victoria-Newhaven boat trains. Although powerful and reliable locomotives, no more of this class was produced, the next Southern electric design was introduced in 1959, (the 24 units of the cute Class 71) adopting a similar booster/pantograph arrangement; but fitted with a single M-G set. Despite their usefulness, sadly all three locos were withdrawn between late 1968 and 1969, victims of being non-standard, and scrapped. A model of CC3 finished in early B.R. livery as depicted could also be attractive. The flat sides and ends would be straighforward to construct, with Box-pok wheels readily available from M.N. tender castings. And there's always the challenge of making a genuine 3rd rail electric powered 'booster' loco, with a working M-G set !